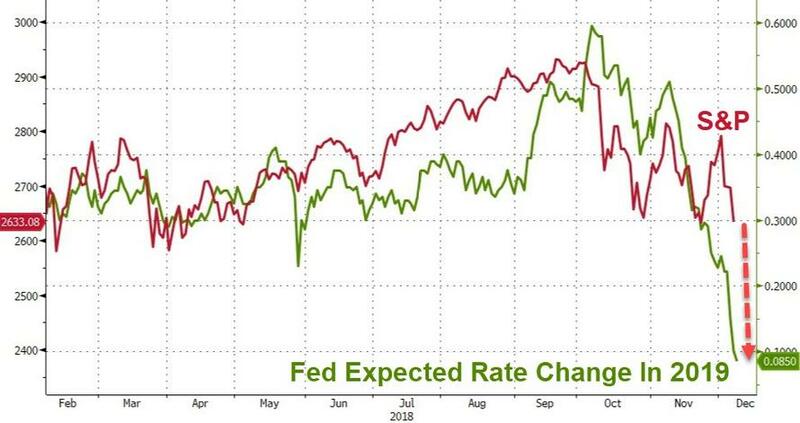 The last few days (leading up to this week's Dec 13 meeting - when it is likely to end its QE program), ECB officials (unlike their Fed brethren, who just won't stop talking) have gone silent on monetary policy as market confidence, economic data, and expectations for monetary tightness all collapse. He is not alone, as Bloomberg notes, most officials have steadfastly ignored the euro area’s summer slowdown, blaming it on temporary issues (such as German car production) and predicting a rebound this quarter. While acknowledging the threats, they’ve stuck to their line even as some numbers suggest the bounce-back may not be much to cheer about. 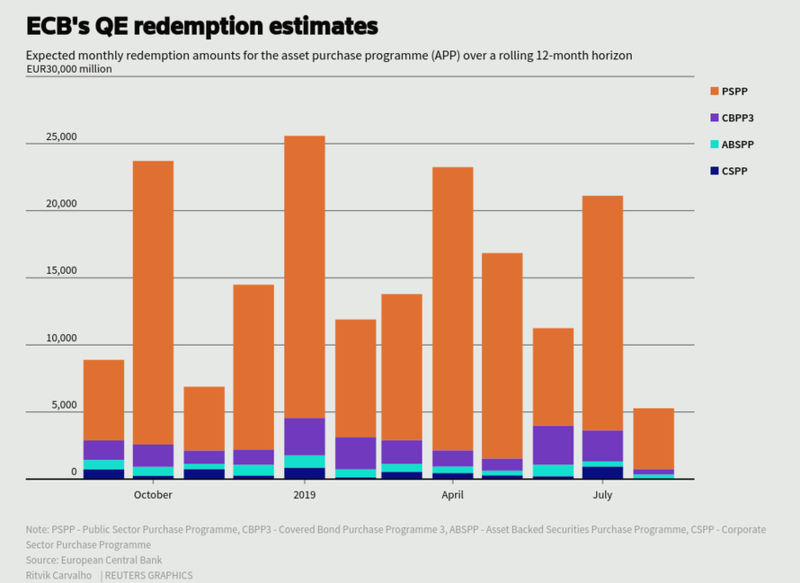 Because no matter what, The ECB wants QE to end, despite the ugly data, as they know they need ammunition for when the next crisis hits. As Peter Praet, the ECB's chief economist, has been at pains to say that capping quantitative easing is a far cry from actually tightening. 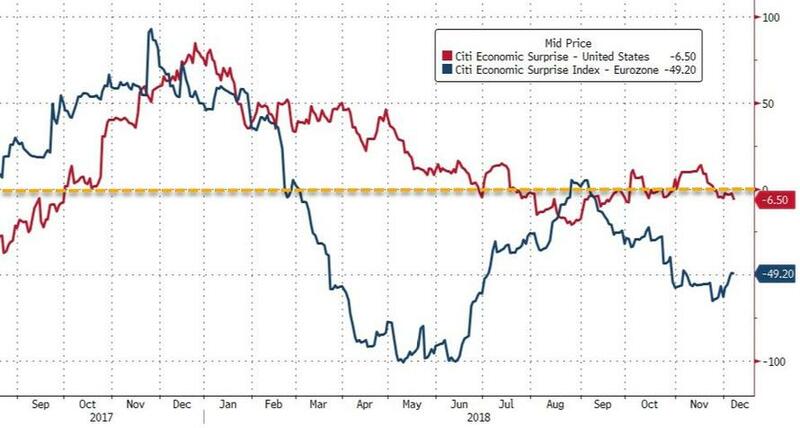 The ECB has said it will keep rates unchanged “at least through the summer of 2019” – economists see no move until at least the fourth quarter (expectations for The ECB's rate-trajectory have fallen recently to just 11.5bps). 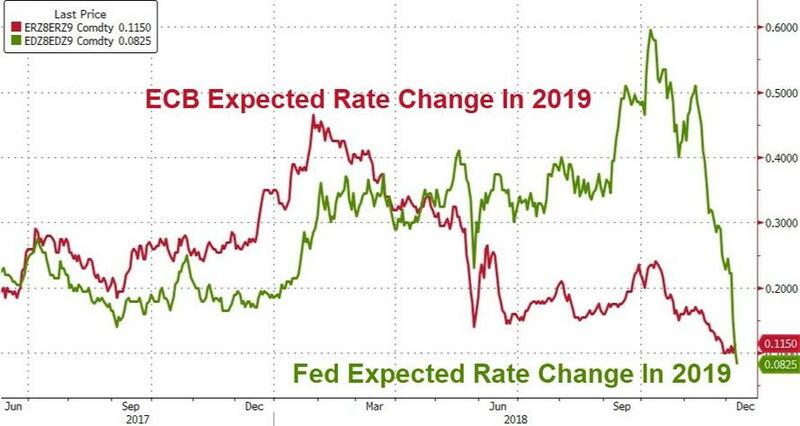 But, after last week's jawboning, expectations for Fed rate-hikes in 2019 amount to just 8.25bps - more dovish than The ECB and a colossal regime shift from just two months ago. It may just be a lump of coal this year. Finally, it may be worth noting that Draghi’s term as ECB boss expires in October 2019... can he keep it all together until then?